For weeks I haven't had the energy to finish this month's adventure for the DMsguild. I have, however, finished the danish website for our charity. I set up the style similar to my original website and changed the logo with the D&D logo and the charity logo. I then created four subpages. The frontpage simply has the poster that we'll be spreading across Denmark in a few months. It was created by Gamemaster Nina and has already been spread out across the internet, hopefully spreading more than currently. I'm doing this in danish in the hopes that it will attract more donors, but if it fails, then I'll probably be reverting to Extra-Life or something. 50 DKK ($7.45 Shoutout) – We give a shout-out during the event. 100 DKK ($14.90 Name) – You get to name an NPC (non-player character), magical item, city, or anything else of your choosing. 150 DKK ($22.35 Reroll) – You give a player or the DM a reroll that the person can use whenever he/she wants to. You may also give a player or the DM "advantage" on a d20 roll as per the basic D&D rules. 150 DKK ($22.35 Healing Potion) – You give a player a healing potion that the player gets to use whenever he/she wants to. 300 DKK ($44.70 Surprise) – Give the enemy "surprise" as per the D&D rules in a single encounter. 300 DKK ($44.70 Critical Success) – Give a player an automatic 20 on a d20 roll. 500 DKK ($74.50 Critical Failure) – Give a player an automatic 1 on a d20 roll. 1,337 DKK ($199.21 New Life) – The party gains an extra life, so if one of the characters die, that character gets resurrected. 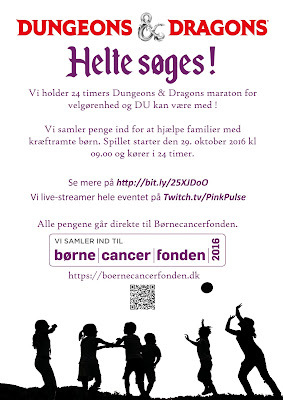 The last two pages include information from our Extra-Life event in 2014 and 2015 translated into danish. The last page has a link at the bottom of the page to the trailer for the event.